My life is about challenging others to rewire their life in some way. So in January I decided to take my own advice. I wanted to rewire some of my play time and decided to learn how to play mah jongg. I wanted something fun; that I could do with friends; that had portability and that would give my brain a good workout! All of the neuroscience data today shows that it's important to constantly be learning something new that challenges your grey matter! 1) I didn't know anyone who played mahjong. 2) I didn't want to learn bridge because it seemed too difficult and serious. 3) I mentioned my desire to learn mah jongg to a friend who also knew nothing about the game but thought it sounded interesting. 4) She and I found a few other women who said they had wanted to learn but for whatever reason hadn't pursued it...yet. 5) We found a great teacher through the National Mah Jongg League and took lessons. 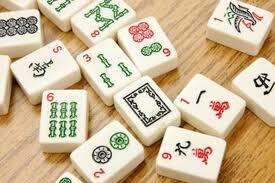 6) The mah jongg teacher orchestrates weekly games, for beginners and experts, and we committed to play every Monday. The key to doing anything new is to do it with frequency;that's the secret to learning. Still for me, one of the biggest and scariest learning experiences was the first time I played mah jongg with strangers. None of my gang was available one Monday so I found myself playing with far more experienced players. Although I was a "wreck" and kept apologizing for mistakes, they were great and I learned a lot from them. What I realized is that it is impossible to become an expert overnight! Regardless of what we are trying to learn ---you have to be a beginner first! There's no way to get around it! Playing mah jongg has allowed me to become a part of a community of women committed to a variety of passions related to mah jongg! Even something fun and simple like where to buy a mah jongg set or mah jongg jewlery on line at places like mahjonggmaven. So whether it's mah jongg, fly fishing, golf, cooking...whatever you want to learn..take a lesson or two or three. Yes you might look like a fool; yes you'll be like a kid again just starting out, but you know you're smart and if you like what you are pursuing you know you will "get it" eventually and that there will be new rewards and fun at the other end! So dare to show your vulnerability and decide to try something new---who knows, you just be good at it!